We are seeing increasing evidence that property prices in London have been turning downwards – perhaps falling as much as 10% in the City of London according to some estimates. However even such a small area as the City hides a broad variety of price movements relating to area, property type, size and asking prices and what applies overall may not be an accurate representation of trends in very specific areas like the Barbican or for specific sizes of properties.. In general analysis of the housing market is seeing falling prices across the board ever since the Brexit referendum, but this is perhaps too simplistic as other factors also need to be taken into account – not least the increased stamp duty land tax (SDLT) requirements on properties valued at over £925,000 and £1.5 million introduced in December 2014. With almost any Barbican property larger than a one-bed falling into one of the higher SDLT brackets these larger properties have perhaps been more adversely affected accordingly. Going a step further, if you are buying what is in effect a second home, or a buy-to-let property, the SDLT rates which then apply were set 3% higher than those in the above table in a new budget in 2016 so, for example, a £1 million property would attract a marginal rate of 13%. That is a pretty hefty hunk of tax to add to agent’s fees and loan costs and is almost certainly a disincentive to such a transaction which will be having an adverse effect on the purchase of high end properties as a second home or a buy-to-let. ThSDLT levels for second homes could also be affecting the purchase of say a studio flat – costing around £500,000 – as a pied a terre. SDLT on such a purchase would total £30,000. Again something of a disincentive to buying adding 6% to the initial purchase cost. 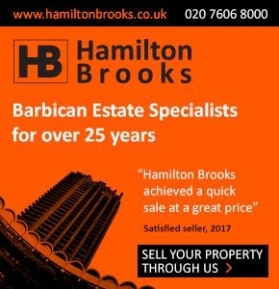 However, as we noted in Barbicania on page 5 of this issue, Barbican properties are almost certainly going to be upvalued once the Elizabeth Line opens, due at the end of the current year, and this may counter some of the adverse effects of Brexit and SDLT on Barbican valuations. Also it’s worth taking into account the old adage that ‘it’s an ill wind that blows nobody any good’. As can be seen from several of the estate agents’ comments below, the Barbican lettings sector is going through a pretty positive phase with some people wanting to live in the area choosing to rent rather than buy until some of the current sales market uncertainties are resolved. This could well also benefit Barbican property owners who are renting out rather than selling into what they may see as a buyer’s market. To set against this, however, the government seems to be targeting the private landlord sector with some increasingly onerous legislation. Coming back to the overall market, local agency, and Barbican Life advertiser since the magazine’s inception 15 years ago, Hurford Salvi Carr, did note in its latest half yearly review of the marketplace that after three challenging years in the residential market, prices across Midtown, City and East London are now back at 2013/2014 levels. The mainstream market for properties, seen as those priced between £500,000 and £1 million, showed price falls of some 4% in 2017 according to HSC, after having held their values in the first 6 months of that year. Larger properties priced above £1m look to have experienced corrections of up to 10%, which will be due to the combination of Brexit and SDLT and this trend will have continued. These falls tend to tally with those estimated by other market analysts. However, we will say that the Barbican remains a bit of a micromarket of its own. While Barbican apartments may not appeal as much to overseas buyers as new builds they do retain a positive domestic image and offer much the new builds do not in terms of amenity value. We may be going through something of a pricing hiatus but we doubt this will continue for long and once the Brexit negotiations are complete and the Elizabeth Line has opened we would anticipate a resumption of the upwards valuation path – at least for the smaller apartments. SDLT increases may put something of a damper on price gains for larger apartments for a couple of years yet but we suspect the Barbican will remain a go-to property market and will yet command good growth premiums in years to come. These comments are from the Barbican property specialists who advertise in our pages, and dominate sales and lettings on the estate. They relate to current market conditions for the Barbican itself and the surrounding area. Nick Scott at Scott City: The City market as a whole has continued to be tough, The Barbican market is slowly improving as we move toward the middle although price sensitive so owners are pricing their properties accordingly. This has encouraged activity which is resulting in an increase in viewings. Fortunately The Barbican continues to be popular and a desirable place to live. Glen Cook: Still good news for Barbican landlords: Rents & demand is up, but supply has fallen. Some historic landlords have taken profit and sold up, which is understandable bearing in mind gains made over the last 5 to 10 years. New Landlords/Investors will gain from lower prices than 2 years ago and increased rents. Mark Scoging at AW Childs: We have seen rent prices hold very strong and, in some cases, increase. We are continuing to see the rental department here at AWChilds Estate Agents expand and we continue to stay very confident for a positive rental market for the year ahead. Tina Evans: For flat owners who would rather not try to sell in a relatively quiet market, our rentals department is still fully occupied letting Barbican properties to excellent tenants. Whatever the scenario, be it sales or rentals, the presentation of a property is the key to success.